This is usually a hard question to answer for most. 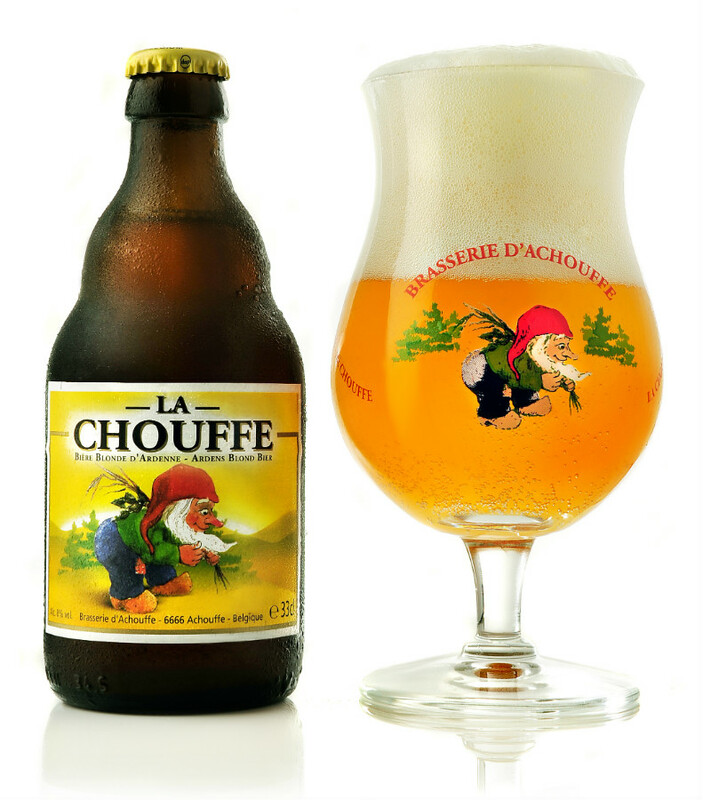 Since I have had the pleasure of traveling numerous times throughout Belgium, my favorite beer or beers are not something that I can choose easily, but I will attempt to provide what I feel are the best offerings in Belgium. Please keep in mind that this ‘list’ might change periodically and I will try to update it as something new hits my taste buds. Also, Westvleteren 12 has, and always will be, my favorite beer on the planet…and I also enjoy most other Trappist beers; so I separated them into their own ‘Top 10’ page to make this list one of beers that my readers can usually find. In an effort to not populate the list with many beers from one brewery, I will only list my favorite two beers from each brewery. I may like 2, 3 or 4 or more beers from one brewery; but will only list my favorite two. Be aware that usually, if a beer listed comes from a particular brewery, you can usually be sure that the other beers produced by the particular brewery are also exceptional. Please keep in mind that no Trappist or Lambics or Gueuzes will appear on this Top 20 List, as they appear in their own list elsewhere on this site. I did have in mind an idea to create the Top 10 Beers from each Province; but found that this project was too difficult to create without showing some favoritism, so I changed this list from a Top 10 to a Top 20. This will be the only Top 20 out of all my lists. I first tasted beers brewed by Struise in 2006 and it was love at first sip. I have tried numerous beers brewed by these mad genius’s, but while visiting Urbain and Phil during a brewing of Pannepouet in late February 2008, Urbain opened a bottle of this beer and shared it with me. The beer poured a very dark brown and the aroma, oh, the aroma! I was hit square in the senses with notes of chocolate, dark fruits, cinnamon, five spice, coffee and the sour appeal of a Flemish sour beer, but more subtle. All this as well as some very nice oak aromas. The flavor profile is incredible. Wonderful notes of chocolate, dark fruits, spices, coffee mingled with nuances of multi-dimensional wood flavors; not in your face but subdued due to the rich malt quality of this beer. When I first tasted this beer I thought to myself; ‘This is the finest beer I have ever tasted.’ The only reason I do not rate it number one, is because, while still a world-class beer, I prefer Westvleteren 12 slightly more. Although the time and place when drinking this beer for the first time added to the overall appreciation of it, there is still something about Westvleteren 12 that entices me a slight bit more. It is unfortunate that this beer is not readily available in the United States. I do find it from time to time, but have to rely on my allotment when returning from Belgium to get me through to the next trip. Pannepot Grand Reserva has aged for 24 months on oak barrels. The main difference between the Pannepot and the Pannepot Grande Reserva is that Pannepot Grand Reserva is matured the last ten months on Calvados oak barrels, adding extra complexity to the beer. This beer is aged 24 months; 14 on new French oak and then transferred to Calvados oak barrels for an additional 10 months. If you can find this beer, buy it and either drink it or save it for a year or ten…or twenty. As per my earlier statement, ALL the beers from Struise are excellent and are ALL world-class. This gr eat beer has many of the characteristics of Westvleteren 12, but is not quite as complex, but still a world-class beer. 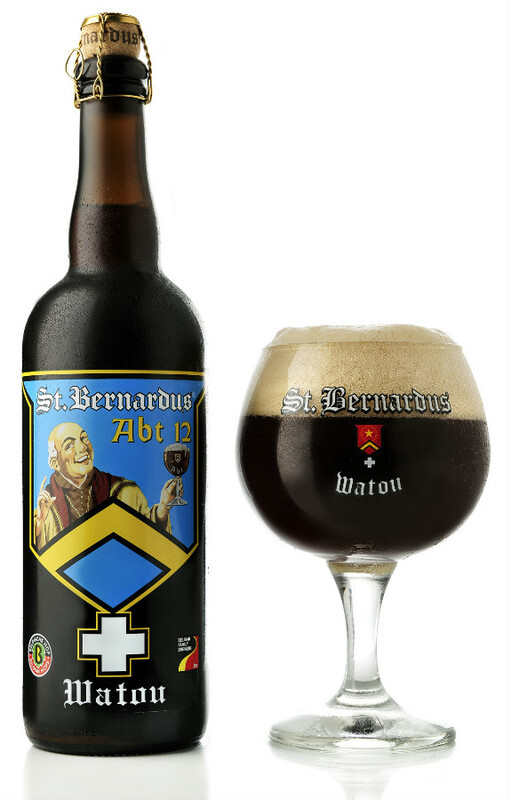 For decades, St. Bernard Brouwerij in Watou brewed the Westvleteren range of beers for the Abbey to take care of consumer demands. When the Trappist designation became a strict appellation a requirement was that the beers had to be brewed within the monastery, ending the arrangement with St. Bernard. Today St. Bernard brews a half dozen beers each unique and each excellent. “Shortly after the Second World War, the Trappist Monastery St.Sixtus in Westvleteren was looking for somebody to commercialize their beer because they did not want to do that themselves anymore. They gave a license to the Sint Bernard cheese factory, and Brewery St.Bernard was founded. 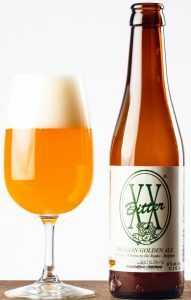 The brew master from Westvleteren, Mathieu Szafranski (from Polish origin) became a partner in the brewery and brought along the recipes, the know-how and the St.Sixtus yeast strain. The brewery started selling the Trappist beers under the brand names Trappist Westvleteren, St.Sixtus or even later Sixtus. During a period of 46 years they brewed and commercialized the beers, while the monks continued to brew for themselves and for sales to 3 pubs in the neighborhood, among which In De Vrede, just next to the monastery. Most of this is factual, but the part about them brewing for themselves and ‘3 pubs in the neighborhood’ fails to mention that they also sold the beer to the locals that lived in the vicinity of the monastery. It was this practice that caused them much grief in the early 2000’s when the beer became known worldwide and they saw thousands of visitors from all around the globe showing up and wishing to purchase the beer from the monastery. This caused great turmoil and the monastery had to institute some strict rules for procuring the beer to eliminate the congestion. The Abt 12 ale pours a dark brown and has an incredible dense off white head. Aroma carries notes of rich dark fruit, coriander, allspice, orange peel and chocolate, bread and rich malt with a nice floral hop nose. The flavor is fantastic and carries through with rich dark fruits, chocolate and spices. I had the pleasure of helping brew a batch of Abt 12 with then brewer Bert Van Hecke in 2006. Bert left the brewery shortly after my visit and now the brewery is owned by Hans Depypere and Marco Paserrella manages all marketing for the brewery. They do offer tours on a regular basis. One just needs to contact them to see if it might be possible to join in a tour. They will not offer tours for individuals or small groups. I love all the Brouwerij Van Steenberge beers. All the Van Steenberge beers have very distinctive tastes and other excellent beers are Piraat, Augustijn, the Bornem beers, Monk’s Cafe, Garre Tripel and many others. The brewery has been in existence sine 1784…so they must be doing something right! “Did you know the Gulden Draak (Golden Dragon) owes its name to the gilded statue on top of the Belfry in Ghent? The legend says the gilded dragon first featured on the prow of the ship with which the Norwegian king Sigrid Magnusson left on a crusade in 1111. He offered the statue to the emperor of Constantinople (the current Istanbul) to put it on the cupola of the Aya Sophia. Some hundred years later, the Flemish count Baldwin IX had the showpiece transported to our regions. Here, the Norwegian dragon ended up in the hands of Bruges. After the battle on the field of Beverhout in 1382, the inhabitants of Ghent took the dragon as war booty and put it on top of their Belfry. In the Belfry all communal charters were kept. The dragon had to protect these documents and it was also the symbol of the freedom and might of the city. Such an imposing symbol that has lasted for over 6 centuries needs an equally imposing beer. 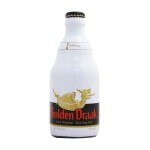 Like the dragon shines at the top of the city, the Gulden Draak is part of the international top of beers. It is a dark triple, which in itself makes it an exceptional beer. But it is the complex taste with hints of caramel, roasted malt and coffee in combination with the creamy hazel head that makes it unique. It is a beer that is worthy of its name. 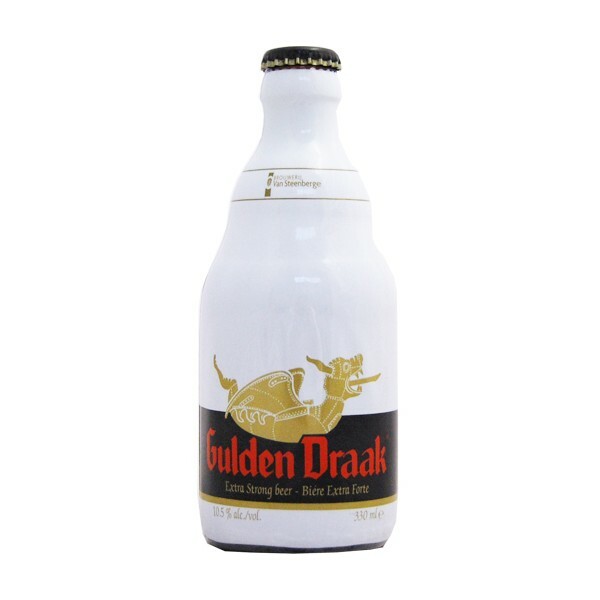 Like the other special beers of the Brewery Van Steenberge, Gulden Draak is a high fermentation beer with secondary fermentation. For the secondary fermentation, wine yeast is used. This also contributes to the unparalleled taste. The beer pours a dark reddish brown with a full head of tight light tan foam. The aroma has notes of dark fruits, toffee and some spices. The flavor is outstanding with complex character including figs, plums, toffee, and some nice spices with the alcohol well hidden for a 10.5% beer. The finish is semi-sweet with a nice lingering malt character. This is truly a world-class beer; but then again, so are all the Van Steenberge beers. This beer is mentioned in my Top 10 Breweries. Cuvee De Keizer Blauw (Blue) used to be a very special seasonal beer that was brewed only once each year on February 24th, the anniversary of the birth of Charles Quint, Holy Roman Emperor, who ruled much of Europe in the early 1500’s. The beer was developed in his honer due to an old story concerning the brewery. The original brewery was started as part of the hospital that was run by the beguinage, an order of pious woman that dedicated them selves to the treatment of others without taking vows or leaving the ordinary world, but did dedicate themselves to God and others. Emperor Quint used to visit the hospital as part of his regular rounds of his ‘domain’ and it is said that he used to enjoy some ale while visiting. At one point he made a reference to the weakness of the ale and the brewers at the time decided to create a special ‘stronger’ ale just for the Emperor. (The brewery was developed because it was known that regular water was poisoning people all over Europe and for some reason, beer did not cause illnesses, so it was always served to people in the hospital.) In 1999, the owners of Het Anker decided to recreate another dark strong ale in honor of Emperor Quint. The beer was only brewed as a once a year special on February 24th, but it became so popular that it is now brewed for the entire month of February. The beer is brewed with 3 types of grain and three ‘secret’ spices; but if you take a tour of the brewery, they will tell you the ‘secret’. The Het Anker web site states, “This exceptional ale ages well, developing a refined complexity and intense aromas. With powerful notes of roasted malts, caramel and plums, its surprisingly soft and fruity aroma combines a warm roundness with a refreshing taste. An imperial brew to cherish and enjoy in moderation.” The beer will age well for up to 15 years – personal experience. 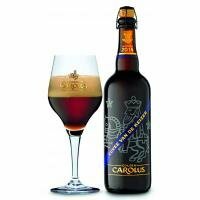 Expect an excellent aroma of dark malts, dark fruits like figs, dates, raisins, toffee, dark sugar and notes of aged port. The flavor is very complex with all the aromas coming through in the flavor. The aftertaste is rich and sweet with some slight licorice character mixed with a dark fruit melange. All the rest of the Het Anker beers are excellent, but this one really shines in my opinion. The Rod enbach Brewery has been in business in Roeselare since 1836. The brewery has 294 Oak casks or foeders where the beer is conditioned giving it it’s unique oakey lactic character. 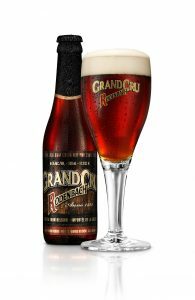 Rodenbach Grand Cru consists of 1/3 young beer and 2/3 beer matured two years in oak. The beer pours a reddish brown with a light wispy head. The aroma is very rich and lactic with tart black cherry notes and some port wine character. Mouthfeel is very effervescent with a lingering lactic sour cherry finish. The result is a complex beer with a great deal of wood and esters, vinous and with a very long aftertaste, just like a Grand Cru wine. 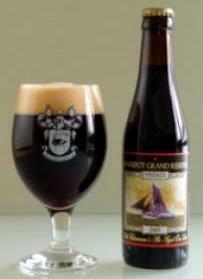 ” The Rodenbach Grand Cru is the archetypal Flanders red-brown beer. Each of these beers is a unique blend, but they all share a brewing process characteristic of the area surrounding Roeselare and Kortrijk. The typical sweet and sour taste of a Rodenbach Grand Cru is produced by a two stage fermentation process called mixed fermentation, involving top-fermentation and bacterial fermentation using lactic acid bacteria. The Rodenbach Grand Cru matures in oak foeders, or barrels, over a period of two years, giving the beer a unique, complex fruitiness that is reminiscent of wine. 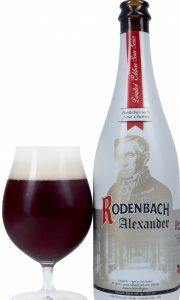 Rodenbach, the mother beer, is usually one-quarter mature beer to three-quarters young beer. 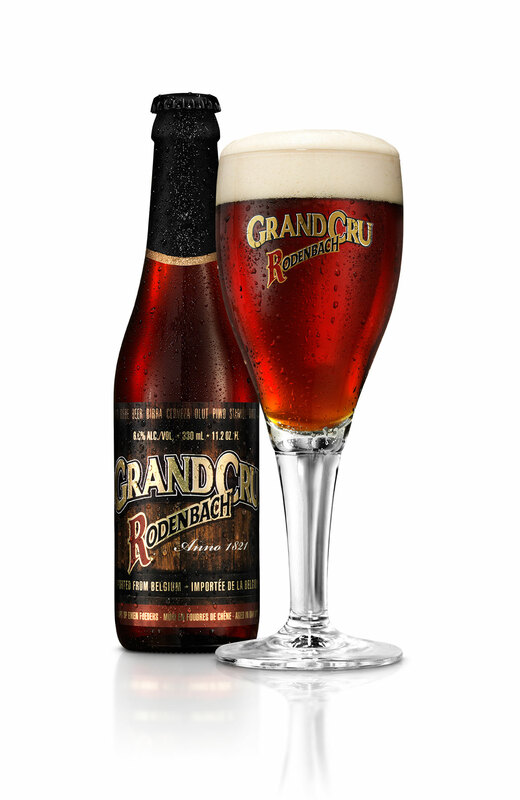 When it comes to Rodenbach Grand Cru, the blend is two-thirds mature beer with one-third of a young brew added. 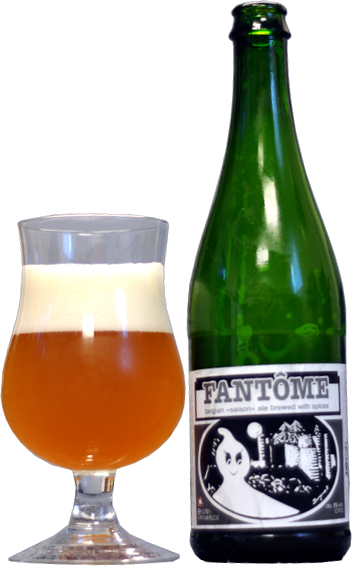 Personally, Fantome is one of my favorite Belgian breweries. Owner Dany Prignon is a personal friend and I consider any trip to Belgium without visiting is not right. Dany started brewing at Fantome in 1988 – over 30 years ago; and does most of the work himself and until very recently 100% without any automation. (He added a bottling machine in 2015 – proir to that all bottles were corked and capped and labeled by hand!) Saison is his flagship beer and usually one you might be able to find rarely in the U.S. I say rarely because Fantome has a ‘cult following’ similar to the lambic breweries and when his beers do arrive on store shelves, they are snatched up by this group. Fantome Saison is what I would consider to be the epitome of the saison style. It pours a wonderful straw wheat color with a nice rocky head that has very minute bits of wheat in it. The head dissipates rapidly into some great lacing. The aroma is so fantastic…when you really absorb all the nuances in this beer…it will take quite a while to ascertain everything that is going on in this complex beer. Note of all types of fruit… apple, pear, grape, lemon, stone fruit and that is all combines with a delightful spiciness including note of clove, pepper, grains of paradise and wheat; and this is all melded into a wonderful melange that actually carries through in the flavor. When tasting, there is a slight sweetness that is combined with all the previously mentioned flavors and the beer dries a wonderful semi dry finish that carries many of the flavors with it. I would recommend anyone wanting to experience the saison style, to try to find a bottle of this and a Saison Dupont and your journey will be complete. This is not to say that there are not other great examples of saisons in Belgium, but in my opinion, these two are the best. I am a sucker fo r tripels, and this is one of the best on the planet. To me, this is also a world class tripel comparable to Westmalle tripel; which IS the standard. 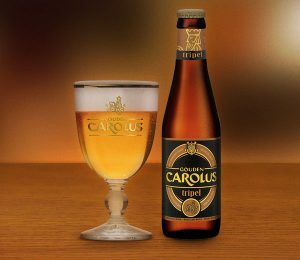 This beer was originally brewed for the great little pub in Bruges – De Garre, that is a must for any visitor to the town. It is not easily found unless you really want to find it. It is off of a main tourist street separating the Markt from the Burg squares. There is a small opening between two shops which is the opening to a nice ancient alley (garre) leading to this establishment. Up a few stairs and you’ll be ready to try this delightful treat. 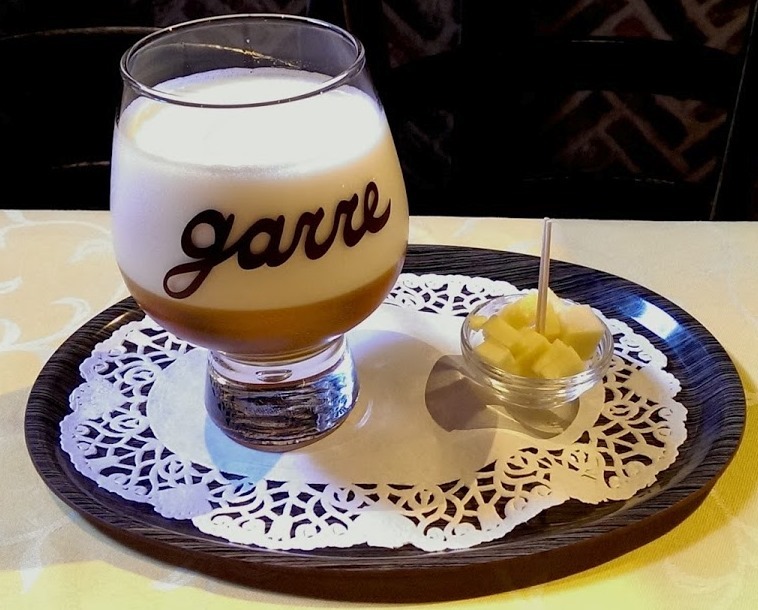 De Garre has a menu that is like a small book with hundreds of bottles selections as well as several more beers on ‘vat’ (tap); but you are here for the ‘grail’. The beer comes in it’s own signature glass that is a heavy one with a solid base with a perfect air bubble in the middle of it. It will be served a full 33 cl, but the glass will appear half full to accommodate the great fluffy head that carries all the aroma to the awaiting nose. (It is also served with a small bowl of cheese to eat with it…a tradition that used to be almost universal in Belgium, but has mostly disappeared.) When it is served – PLEASE don’t ask the bartender to fill the glass all the way for you…this will only show that you are unsophisticated and although the request will be denied…you will also find that your second beer will never be offered. The aroma is pure tripel, sweet, malty, spicy, with note of lemon, white grape, apple, stone fruit, banana and pear along with some spiciness including coriander, peppercorn, clove, candi sugar, bread or cracker, herbs along with some floral grassiness and yeast earthiness. The head lasts FOREVER! The aroma includes all the above and the 11% alcohol is well hidden…so well, in fact, that I have seen many people drink 2 or three of these without knowing the danger and then have trouble standing up. Fortunately, you can find this beer in bottle shops in a 750ml size bottle and is also available on draft in the U.S. from time to time. If you ever see this beer – BUY IT! 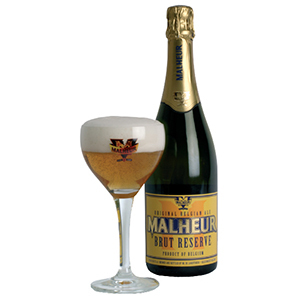 Malheur beers are brewed by De Landtsheer Brewery (recently renames Brewery Malheur). The Brut Reserve is produced using the Champagne method which means that the bottles are stored at cave temperature in an inverted position. When the beer is properly aged the temperature is lowered until the beer (and all residual dregs) is frozen in the neck of the bottle. The ‘plug’ is removed and the bottle is corked. Brut Reserve pours a golden straw color and produces a huge head that remains for some time. The aroma is very complex with notes of malt, straw, fruit, pepper and mild notes of tobacco and oak. The taste is a wonderful complex cornucopia of a malty herbal fruity carbonated wonder. It is sweet, but not too. It is dry, but not too. It is hoppy, but not too. Maybe brewer Manu Landtsheer should rename it ‘Not Too Ale”. It finishes with a wonderful sweet dryness with a slight peppery note. Wonderful! 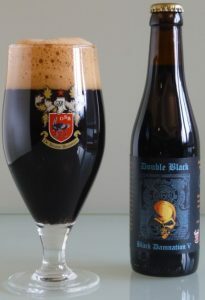 There is also a version of this brew called ‘Dark Brut’ which is like drinking chocolate in a bottle. Both are very hard to find in the U.S.
DeDolle Brouwers (The Mad Brewers) is owned by the Herteleer family who purchased the 150 year old brewery in 1980. Brewer Kris and his wife Els run the brewery and mother Moes used to be the illustrious tour guide until she retired at age 90. This is one of my favorite visits in Belgium and the Herteleers are wonderful people. It is a pity that it is very difficult to contact them, as I would love to include them on my tours…. 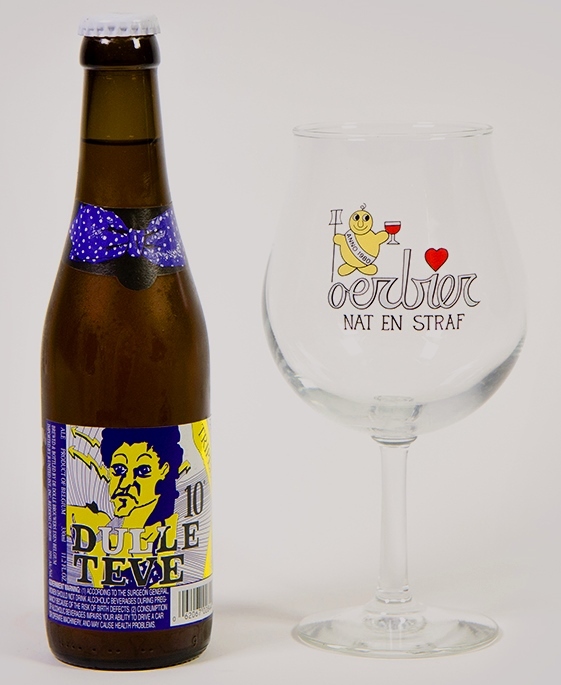 I would consider Dulle Teve a Tripel on steroids. It pours a wonderful hazy golden color with a full head. The nose produces straw, citrus fruit (heavy on the grapefruit) some faint pineapple and pears, herbs, some bread, some honey – -will it ever end?? The taste is incredible. Another complex mixture of fruits, hops, earth, candi sugar, herbs and alcohol. It has a great finish that leaves faint traces of fruit and straw that lingers and begs you to have another taste. This is a ‘World Class” Tripel. Duve l is one of my main ‘go to’ beers and I have told people that this is my real ‘lawnmower’ beer. Produced by Duvel Moortgat brewery in Breendonk, north of Brussels, Duvel has been one of the top selling Belgium beers for years. 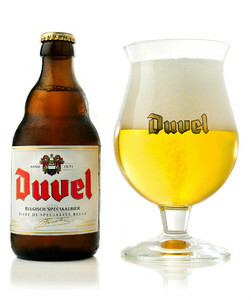 Duvel has it’s own special goblet that is recommended as when the beer is poured, it produces a huge white fluffy head that lingers for a very long time. When poured into other glassware, a similar head is produced, but not as dramatic, not as long-lasting as in it’s original chalice. The aroma is very rich grains with some great spice character with some green apple and citrus notes. The mouthful is very effervescent with a cleansing character. Finish is crisp and spicy. I had to mention a couple of ‘honorable mentions’ since both of these beers Saison Dupont is a classis saison, or farmhouse ale by which all other saisons are compared. It is a very dry ale with floral notes of citrus, bread, and fruits. The effervescents is nourishing and refreshing—a popped cork brings forth a hazy straw yellow ale with a fluffy white head that almost begs to be scooped with a finger. As brewers around the world try new things with saison, adding new ingredients and whatnot, it’s imperative to take time and appreciate the classic. ” The Saison Dupont is a top fermentation beer with refermentation in the bottle. Since 1844, this beer has been brewed in our farm-brewery, during the winter time. Then this beer became a second refermentation in the barrel. During the next summer, this very thirst-quenching beer was served to the “saisoniers” which were working on the fields. This beer was originally brewed for the Knights of the Golden Fleece in 1491. Full graceful tenderness, with a clean and neat taste, this beer will enchant you: matured in the bottle, exclusively obtaine d from pale malt, highly fermented and 100% natural. With a full-bodied flavor that still works thirst quenching, thanks to a balanced hopping. 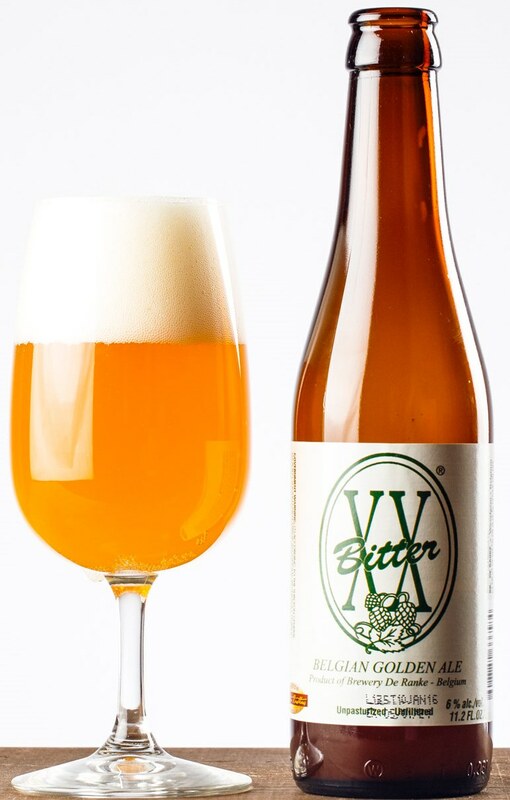 It is a classic tripel with notes of grain with a subtle spicy sweetness and nice lingering finish. Although Westmalle tripel is my favorite tripel in the world, this beer is a close second runner up for my favorite tripel. ” Despite the technological advances, this beer is brewed according to ancient tradition and unites, as before, the best raw materials from our soil as ripe barley and fine hops, to preserve a maximum of pure flavor. This beer was originally brewed for the Knights of the Golden Fleece in 1491. This beer was one of the first beers over 20% alcohol that was very well put together and actually tastes like a beer. The beer was one of the earliest ‘ice crystal’ beers produced by Urbain and crew using Cuvee Delphine as a base and ice distilling it until it reached an astonishing 26% alcohol. The first time I tried this beer was with Urbain and Carlo while visiting the brewery many years ago. I was totally blown away! The beer poured darker than motor oil and had a very thick viscosity. Aroma was very thick malt base with loads of oak, coffee, bourbon, chocolate, some anise, smoke and molasses. The flavor is a blend of all the above descriptors and is incredible smooth for a beer of this magnitude. It was thought to be a one-time release and the initial bottling was quite pricey, but they have made it again once or twice and there are still some bottles around. I recently say some 11.2cl bottles…so this must be something they will make as a semi-regular brew. The first bottling had some foil wrap around the top and is very distinctive. This beer, when first released, was quite a surprise. This was before the ‘hop craze’ hit Belgium and at the time, Poperinges Hommelbier by Watou Brewing was really the only ‘hoppy’ Belgian beer, and it was a mild one at that. This beer when poured is full of wheat notes as well as a nice spicy hoppiness from the generous doses of Brewers Gold and Hallertau Mittlefruh. One will also note some grassy and barnyard notes with a nice spiciness from the hops additions. It pours with a nice full head that remains for some time. The flavor is characteristic of al the aroma descriptors. I find this beer to be delightful. The owner of the brewery, Vincent Dilewyns, was a dentist that home brewed and the ‘hobby’ got out of hand. He went to brewing school and started brewing commercially in 2010. Along with his 2 beautiful daughters, Claire and Anne-Catherine, they produce some world class beers and the Tripel Gueuze is one of those. Anne-Catherine, in one of the youngest female brewers in Belgium. Claire handles all the marketing. The beer pours a cloudy straw gold color and then the aroma hits…you really don’t even need to lean into it…it comes to greet you! 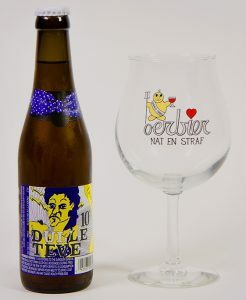 There is a sweet and sour melange of aromas including some of the fruity esters associated with tripels – stone fruits and very very mild banana blended with all the funky sourness from the gueuze blending – horse blanket, barnyard, grass, hay, bread…but neither one dominates the other…it is a perfect blend of both wonderful styles. The Girarden gueuze that they use to blend with doesn’t overtake the nuances of the tripel, nor vice versa. The initial taste brings forth all those great tripel flavors but then the funk follows, not abruptly…but gently…almost sneaking up on you with all those great gueuze characters… Just let the beer mellow in your mouth for a few seconds and the gueuze really shines. Al exander originally came out as a one-time special in 1986 to commemorate the 200th anniversary of Brewery Rodenbach. The beer was a smashing success, so they decided to brew it again the following year and the year after. 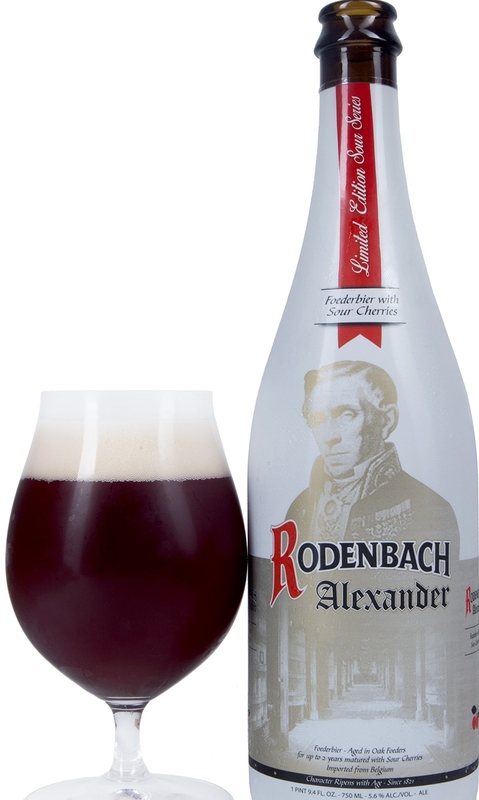 This continued until Palm Breweries purchased Rodenbach and this beer was discontinued. I still have bottles of the original release and they are still fantastic. It is made using 2/3 of old Rodenbach beer of 24 months and 1/3 ‘new’ beer and then sour cherries are added. The beer is allowed to ‘meld’ for another period of time before the remaining cherry pulp is removed, the beer is strained and bottles and kegged. It is now available in the Y.S. once again. This is a remarkable beer. When very fresh, the cherry aroma explodes along with other hints of stone fruit, apples, pears, raspberry and other floral characters. The initial taste is quite tart, but that dissipates quickly into a lovely cherry flavor that causes every taste bud in your mouth to sing. Personally I like to keep this beer for a minimum of one year before drinking and even longer is OK. The Rodenbach yeast strain is one of the hardiest on the planet and it continues to chew on sugars for many years. There is a new bottle style out currently that is darker, so just look for the Alexander label. 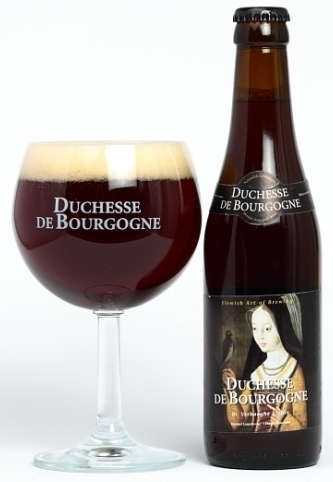 Duchesse is a Flanders red style ale which after a primary and secondary fermentation is matured in oak foeders for 18 months and then blended with a younger 8 month old beer before bottling or keggi ng. 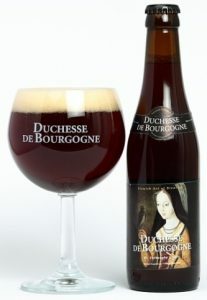 The beer was named to honor Duchess Mary of Burgundy who was the only daughter of Charles the Bold, born in 1457, but died tragically in a horsing accident in 1482 during a falcon hunt. Pours with a nice full off white head that produces an abundant amount of aromas that include vinegar, sour fruits, cherry, green apples, pepper, some caramel and other spices that meld into a wonderful melange of aromas. Some say it reminds them of balsamic vinegar; but this would be too excellent to pour over a salad. All those aromas are transferred into the taste as your mouth starts to salivate uncontrollably because of the lactic character of the ale. When the beer is chilled too much the lactic character is most evident…as the beer warms, all those great cherry flavors come through along with all the other flavors.This is a beer to be consumed slowly so it can evolve. Yes, I know this beer changed after Brasserie D’Achouffe was bought by Duvel/Moortgat, but it is still an excellent beer. The beer is categorized as a Belgian pale ale and it fits this bill as well as a strong golden and if it had a bit more haze, one could say it has some characteristics of a saison. No matter the style, the beer is refreshing and wonderful. The beer pours a great orange-amber color with a huge head that remains for quite some time and slowly dissipates into some nice lacing. The aroma is of fresh cut grass, some spiciness from the coriander along with some other crisp earthiness. The taste is Belgian yeast, spice, clove, raisin, floral and spicy hops, earthiness and is considerably dry for all the flavor going on. The finish is semi-sweet and semi-dry with a lingering taste from the hop additions. A great beer for a summer afternoon or for dinner along with some firm fish, chicken, pork or really almost anything. It is a great and refreshing beer. Aged Red is one of many fine beers from this brewery. 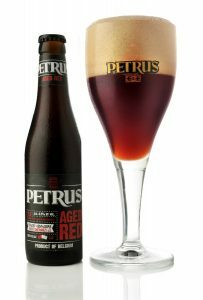 They start with a base of Dubbel Bruin (Brown) ale to which 15% addition of Petrus Aged pale is added and then the beer is transferred to a foeder on top of fresh cherries and allowed to meld for a period of time determined by the cellar master. The beer pours a amber red and has a full head that dissipates quickly. The aroma immediately takes you in and you know this is a world-class sour beer. This was and is ‘the sour’ long before the more recent wave of sour beers took over the market. Aroma includes sour apple, grapes, cherry and other stone fruits, pineapple, oak, malt, citrus and some barnyard character. When sipped, you discover a well-balanced arrangement of all the above aromas, with the added attraction of a great lactic character that is not overwhelming, but helps to ‘blend’ all of these flavors into a cornucopia of wonder. The finish is semi-sweet , sour and dry. This wa s one of the three Belgian beers I tried for the first time back in the early 90’s. While sitting in an underwhelming microbrewery (yes they had them back then) I notice three stubby bottles sitting on the shelf behind the bar. Asking the bartender about them, he replied ‘Oh, those are some Belgium beers that have been here forever…they’re terrible…’ Those three beers were Gulden Draak, Piraat and Chimay Blue. Since the house brewed beers were not well constructed, I tried the white bottle first – Gulden Draak, followed by Piraat and finished with the Chimay. I was IN LOVE… Since that time, these three beers can always be found in my home bar and I drink them regularly. 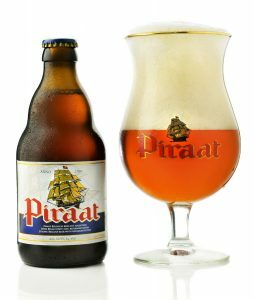 Piraat is defined as a Belgian Strong Pale. I consider it a cross between a Belgian Golden Strong, a tripel and an IPA. The hops don’t get in the way of the full malt bill and the alcohol, while slightly fusely, it is well constructed so that none of the components overwhelm the others. It pours with a full frothy head that lingers for some time and that head pushed forth a full array of aromas including green apples, pears, bubble gum, slight banana, nice spices including pepper, clove and coriander with a nice floral aroma of the hops used. The taste follows suit with all these descriptors, but included a bit of apricot, peach and bread along with the nice warmth from the alcohol. When cold, the spices and the hop bite are negligible, but when it warms up it really blossoms. The head remains for some time and then leaves some nice lacing in the glass. The finish is slightly bitter with sweetness from the sugars and slightly drying. This is another very hard to find beer and might not be to the liking of everyone; but I loved this beer, but I use the term ‘beer’ lightly as this is closer to a wine than it is a beer. Pours a golden orange color with almost non-existent head with virtually no lacing. Aroma is tart, notes of honey, light tropical fruit, some mild spiciness and some floral hop presence. Taste is incredible and very complex. Notes of mild honey, mild dark and tropical fruits, some mild spiciness and that wonderful Rodenbach yeast character that I have always loved that seemed to have dissipated in recent offerings from Rodenbach/Palm. If you ever see any of this beer, buy it. If you don’t like tart beers, please e-mail me and tell me where you saw it.